NorthWood made quick work of Triton on its home court Thursday afternoon. The Panthers gave up just six points on its singles courts. Reegan Miller at No. 1 and Alex Jesse at No. 2 both won by losing just one game each, Miller a love and one final over Molly McFarland and Jesse and one and love final against Maddie Ritchison. Gretchen Adams finished off Ivy Powell four and love at No. 3. Riley Graber and Lauren Mikel put away Emma Hepler and Lexia Hostrawser three and two at No. 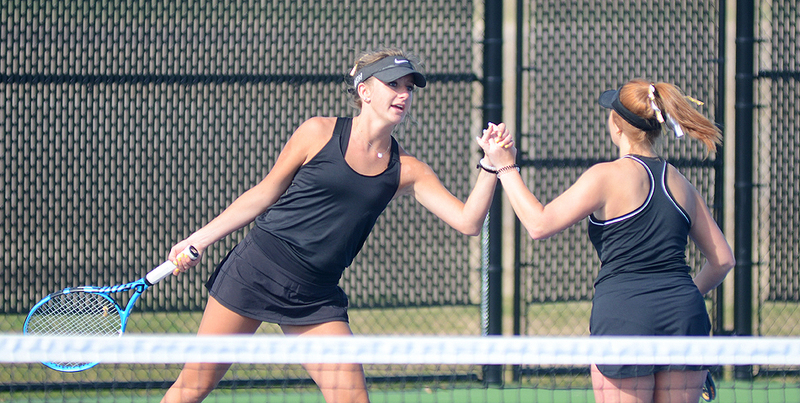 1 doubles while Caroline Mullet and Kate Stillson won another at No. 2 doubles, one and one, against Haley Hooley and Madison Davis. NorthWood lost just one game in its three JV contests, won by Jessica Kramp, Bella Sechrist and the doubles duo of Reese Barhydt and Maya Engbrecht. NorthWood (3-0) will open Northern Lakes Conference play Friday at Concord while Triton (0-3) will take part in Saturday’s Plymouth Invite. Warsaw got its tennis season underway in fine fashion by shutting out its sectional rivals in the Whitley County seat. The Tigers won all five courts in straight sets, led by a one and love roll by No. 3 Rachel Boyle against Maddie Miner and a shutout at love-love by No. 2 doubles team of Maddie Ray and Amy Herendeen over its foes Courtney Weigel and Brenna Malcom. Alyssa Zellers stepped into her first-ever match at No. 1 singles and came through with a three and one win over Jette Honnens while Taylor Schoaf played her first-ever varsity singles contest and posted a two and four win on Hiley Cearbaugh. At No. 1 doubles, Rachel Yeager and Raegan Merchant finished off Addie Bishop and Grace Martinez one and two. Warsaw won 10 of the 12 JV courts, winning all three singles courts played by Izzy Ray, Gracie Lewis and Anastasia Kalikova. Warsaw (1-0) will host its Tiger Tourney Saturday morning. A sweep in singles play afforded Wawasee an NLC win against the RedHawks at Goshen College. Kendra Doerr got Wawasee its first win, three and one, over Lucy Kramer at No.1 while Elizabeth Kleopfer rallied for a 6-1, 4-6, 6-3 win at No. 3 over Sophia Kirkton. Wawasee clinched its conference win when Peyton Rookstool won a third-set tiebreaker, 6-3, 6-7, 7-6, over a very tough Anna Podgorski. Goshen won both doubles matches in straight sets. At No. 1, Brooke Grewe and Kathryn Detwiler spun Kaitlin Graber and Molly Jones four and one while Sage Christner and Sophia Kellenberger took care of Abby Morehead and Tate Cowan one and four at No.2. “Another nailbiter and really impressive showcase of mental toughness from Kleopfer and especially Rookstool who was our hero tonight,” stated Wawasee head coach Shane Staley. Wawasee claimed each of the six JV doubles matches against Goshen. Ava Harker and Becca Smith each won two matches to highlight the JV play. Wawasee (2-0) will take part in Saturday’s Jimtown Invite.